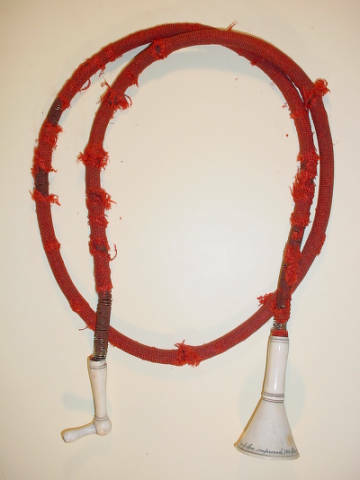 A conversation tube constructed with red silk, ivory mouthpiece, and ivory ear insert, made by Rein & Son. Courtesy of The Central Institute for the Deaf-Max A. Goldstein Historic Devices for Hearing Collection. Becker Medical Library, Washington University School of Medicine (VC703001). This particular conversation tube is one of the earliest devices at the CID-Goldstein Collection at the Bernard Becker Medical Library. It was designed and sold by Frederick C. Rein in London, who established the first commercial firm for hearing devices in 1800. The maker’s trademark is inscribed on the mouthpiece as “Rein and Son. Improved. 108 Strand, London.” A very simple design, this 56inch conversation tube is composed of an ivory mouthpiece and ear insert, with two layers of red silk woven around the coiled metal tube. Designs of conversation tube were relatively uniform. The standard design for a conversation tube included ivory for the earpiece and mouthpiece, with black wool, leather or silk covering the coil. Later designs incorporated different materials for the tubes in attempts to increase hearing amplification, including: wood, rubber, or celluloid. Ornamental designs were also present in some versions that were preferred by aristocratic or fashionable users and were likely more expensive than standard designs. Some manufacturers, however, abstained from using rubber or gum solutions in their designs, in order to protect the device from climatic conditions (Hawksley). In some cases, the designs were a compromise between amplification and portability, especially as some individuals may have preferred smaller designs to be folded and carried in their pockets (Mills, 76). The length of most tubes was 88 to 176 cm, with an average price of 1 guinea for the most powerfully amplified versions (Bennion), which would enable the user to hear at least 20 to 40dB of sounds (Berger). The red silk of this conversation tube is the most striking design feature, suggesting a fashionable and feminine trait embodied into the design. Even more remarkable is the conspicuous nature of the device, suggesting that the user had no qualms about hiding her deafness. Conversation tubes in general, were not disguised devices to be used in private. To use the device, a user needed to make his or her deafness apparent, since the very nature of the device “required the presence of one other person, who might judge you on your plebeian and unattractive listening device” (Church). As the Hawksley catalog of acoustic instruments declares, “A Conversation Tube is the most useful form of instrument for severe cases of deafness, or when a person is only moderately deaf and wishes to carry on a conversation with a friend” (Hawksley). Bennion, Elisabeth. Antique Medical Instruments (Berkley: University of California Press, 1979). Hawksley, T. Catalogue of Otacoustical Instruments to Aid the Deaf, 3rd Edition (London: T. Hawksley, 1895). Koelkebeck, Mary Lou, Collen Detjen, and Donald R. Calvert, Historic Devices for Hearing: The CID-Goldstein Collection. St. Louise: The Central Institute for the Deaf, 1984. Mills, Mara. “Hearing Aids and the History of Electronics Miniaturization,” in Jonathan Sterne (Ed. ), The Sound Studies Reader (London & New York: Routledge, 2012), 73-78. “A Red Conversation Tube,” Nineteenth-Century Disability: Cultures & Contexts, accessed April 23, 2019, http://nineteenthcenturydisability.org/items/show/44.